Take the media from the billionaires! Stop the local government fire sale! US debt: into the abyss? 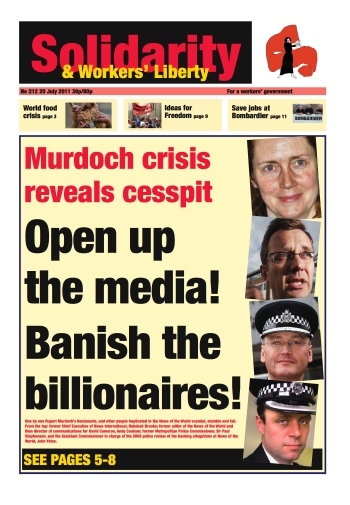 What is the socialist alternative to the "free press" that produced Murdoch? The dispute dubbed “the UK’s Wisconsin” has entered its third month as Southampton local government workers extended their strike against mass redundancies and pay cuts. Workers including parking attendants, toll collectors and port workers began a week-long stoppage on Monday 11 July as the council’s deadline for accepting the new terms came and went. While most workers have accepted the new contracts, those who haven’t have not yet been sacked. In Egypt, exasperation with the military council which has ruled the country since the revolution pushed out former dictator Hosni Mubarak on 11 February has spilled out onto the streets. People have been camping out in Cairo's Tahrir Square since 8 July, and there have also been big protests in Suez. The heroic uprising of the Syrian people against brutality and despotism continues to grow despite intimidation, mass arrests, torture, extreme violence and murder. The biggest street protests since the movement erupted in March took place on Friday 15 July. The marchers were demanding the release of political prisoners. It is estimated that 10,000 have been detained since March. Rami Abdel Rahman, of the Syrian Observatory for Human Rights, said one million people turned out in just two cities: Hama and the eastern Kurdish town of Deir al-Zour. The National Union of Teachers (NUT) Executive is talking about the idea of second strike against pension cuts in the week beginning 7 November, to follow on from the one on 30 June. NUT is in talks with the other “J30” unions, as well as the National Association of Headteachers. NUT is also discussing the prospect of a mass lobby of parliament in October, for which it hopes to mobilise at least one teacher from each school in the country. A special executive meeting on 9 September, the first week of the new academic year, will discuss the issue further. On 27 June, NATS, the UK’s main provider of air traffic services, received notification of rejection of the pay deals offered to two sections of its workforce. Prospect ATSS, which represents engineers, and PCS, the union for operational assistants and administrative grades, returned ballots rejecting their offers by 88% and 79% majorities respectively, on turnouts of over 75%. The offers made consisted of 4% for year one (Jan 2011), followed by RPI capped at 4.5% in year 2, with significant strings attached for both groups. Does the News International scandal imply a need for public intervention in the media? Or would that lead to restrictions on the ability of journalists to investigate corruption within powerful institutions in society? Ian Overton, award-winning documentary maker and Director of the Bureau for Investigative Journalism, gave his views to Solidarity. In 1986-7 5,500 print production workers were sacked for striking against an attempt to impose new draconian terms and conditions at Rupert Murdoch’s new, then state-of-the-art, printing plant. The story is beautifully told — with first-hand accounts recorded shortly after the dispute ended — by former Times librarians John Lang and Graham Dodkins. This “warts and all” account, describing the humour, commitment and comradeship of the printworkers, is a great source of political lessons. Britain’s newspapers are probably the worst in the world, aside from the state-controlled newspapers under dictatorships, which are bad for different reasons. Some British newspapers, such as the Financial Times or the Guardian, are no worse than their equivalents in other countries; but Britain’s redtops are foul in a way rare elsewhere, even in countries where Rupert Murdoch owns many newspapers. This result is a triumph of capitalist market forces. It happens because Britain’s redtops have an unusually favorable marketplace. In October 1992 the Independent on Sunday (IoS) published a smear article by its then political editor Stephen Castle suggesting without evidence that sympathisers of the Alliance for Workers’ Liberty and other leftists had tried to rig ballots (in Sheffield) for the National Executive Committee of the Labour Party. We wrote a letter stating that the claim was nonsense; we oppose rigging elections. Our letter was printed, but edited in such a way that it made little sense. The cheating charge was taken up by other papers, including the local Sheffield Star.